So, your students tell you they hate writing or they profess they are not good writers. Why beat them over the head with writing essays? Here are ten digital writing tools to help build writing endurance and have students create authentic and creative writing pieces. Blog It – This year my students are blogging about their Genius Hour projects. Each of their blogs detail and record their passion project research and findings. Students can create blogs about anything and everything so don’t only have them write on lined paper for your eyes only. Let students write for a global audience and write about topics that are meaningful to them. Collaborative Writing with Google Docs – Whether students are working collaboratively compiling research for a debate or working together to write a screenplay or story, why do it alone? So many authors today are collaborating and students should be able to work together too. Digital Inspirations – My friend and colleague, Carol Varsalona creates these amazing pictures and inspirational words on her blog Beyond LiteracyLink and has all different writers, teachers, and artists contribute their own digital inspirations. Have your students take their own photographs and write inspirational words, poems, ideas to go along with the images produced. 4. Podcasts are a great way to get students writing, speaking, and collaborating. I am a huge fan of NPR’s RadioLab podcasts and have used them in my classroom as a mentor text. Students can script their podcasts before recording them and make their own radio shows on all different issues and topics. 5. Prezi Picture Books in lieu of a traditional picture book, students can create their own digital picture books using Prezi or Google Slides and then screencast an audio file reading aloud the picture book created. 7. Remember the Choose Your Own Adventure books in the 1980s? Have students create their own Choose Your Own Adventure story or research inquiry using YouTube, Thinglink, or SymbalooEDU. Students do all the writing and research and allow the viewers to choose the direction of the story or inquiry. 8. Create Your Own Textbook on Wikispaces. What if you had students create the course textbook for the students next year? Let students curate the materials, and design the texts that are essential to classroom learning and content knowledge. 9. StoryWars is a website that was recently shared with me because it is a collaborative story telling website where people can upload their own stories or contribute a chapter to an existing story. Participants can read a story, write a chapter, or vote on a story’s path. 10. Make it a graphic novel using ToonDoo or Bitstrips blending dialogue and cartoon images together. I have just arrived home after attending the ISTE (International Society for Technology Education) annual Convention. The conference is an incredible opportunity for teachers, administrators, and anyone working in technology and education to see amazing speakers, innovative technology for the classroom, collaborate and be inspired. Below is a list of all the super cool technology tools that were shared (new and old). I have organized them according to the Common Core Standards to help think about how to use them in the classroom. The key idea of the conference is that it is not about the tech tool but building relationships, engaging students, teaching skills that will help students think deeply and succeed. Today I attended the Edscape Conference at New Milford High School in New Milford, NJ. If you participate in #Satchat or the 140Characters Conference you might know many of the innovative educators presenting at Edscape, sharing ideas about innovation, collaboration, and transformative teaching and learning practices. The conference is organized by principal, Eric Sheninger of New Milford High School and Teq. Throughout the day I was inspired, made connections, and collaborated and networked with many educators. George Couros, principal of Innovative Teaching and Learning with Parkland School Division in Alberta, Canada kicked off the conference with a hilarious and meaningful keynote. He spoke about meaningful creation, disrupting our routine, and allowing our students the opportunities to do the extraordinary. Each year I challenge myself to use less paper and teacher at NMHS, Vikki Smith, shared how she has gone completely paperless in her High School science class this year by using Nearpod, Edmodo, mobile devices, and Classmarker. Class wikis, blogs, and Google Drive are also great tools to help reduce the amount of paper used in schools for worksheets, and handouts. I am going to try out the Classmarker for creating and administering a quiz this month. This fall my middle school students are participating in the global collaborative project “Digitween” created by Julie Lindsay and Vicki Davis of the Flat Classroom Project. The project centers around digital citizenship. But digital citizenship is not one lesson that is taught one day. Rather, teaching digital citizenship is ongoing so that my students understand their responsibility as a global citizen. Bill Krakower and other teachers of the Global Collaborator Network shared many more global collaborative projects that teachers and students can participate in. The assessments and projects that my students do in my class need to matter in life, not just in school. Dr. Robert Dillon addressed how voice, choice, and authentic audience need to be central to learning. These three elements are the keys to engagement and integration. Teacher Matthew Morone shared his experiences with his class using Twitter as a tool in his English classroom. As my students are reading we will try out Twitter as a web tool to record observations, define terms, decipher allusions, apply critical theories, argue claims, and justify connections with others. For a summer reading assessment my students created a movie trailer for the second required reading book they completed. Students selected a second summer reading book based on a list of titles recommended by their teachers. I am over the book reports, power points, and dressing up as one of the characters as a way to assess readers in “creative ways.” I wanted students to impress me with their technology and reading skills by creating a book trailer that would captivate an audience to go out and buy the book. I am beyond impressed by the awesomeness that my students created! Some of the trailers give me chills and others make me think I have the next Oscar award winning director sitting in my classroom. Technology can be used to create a wide variety of reading assessments. Whether using video, Prezi, Storybird, Glogster, or blogging, there are unlimited web 2.0 applications that allow student to share what they know and read in a creative way with others (not just the teacher). All my students’ book trailers would uploaded on to our class Wiki so they could be seen by many. Mark Prensky said, “Instead of looking at our kids’ test scores, let’s see them as individual people and partners in learning.” The trailers that my students created tell me so much more about them as individuals, thinkers, and creators, rather than a test score. My goal as a teacher is to balance between the tests and the projects so that I can encourage a sense of independence, critical thinking, and close reading capacities in all of my students. Here are a few of my students’ trailers just to get you to go out and read the book! I have said over and over again that Twitter has revolutionized my professional development and learning. Twitter is a tech tool that I use everyday professionally and, I have even started to use it with my students. This past spring my eighth grade students initiated three different Twitter discussions about To Kill a Mockingbird. Twitter allowed students to extend classroom conversations and collaborate outside of the classroom. 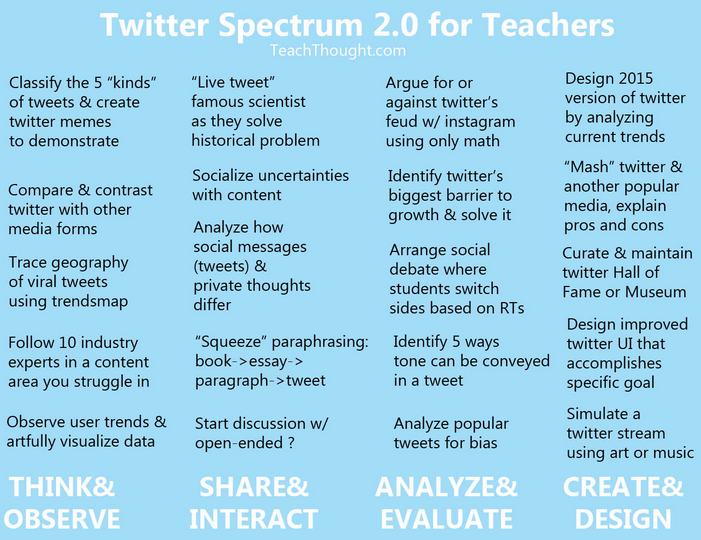 Last week I taught a workshop to teachers in my school district on Twitter for Educators. Whether you are new to Twitter or have started to get your feet wet with this social media, check out the resources below to help you utilize and learn about the potential Twitter has to offer. It means to differentiate with technology. Differentiation is a buzzword in the education world. Teachers are being asked to provide alternative ways to help student learn. Differentiation provides students with choices or options based on their readiness, interests, and learning styles (think multiple intelligences). Teachers differentiate content, process, and product. Techerification also differentiates content, process, and product but is technology centered. Techerentiation involves choices for students. Students are given choices to make personal decisions how they want to complete to demonstrate what they have learned but the choices are all technology based. “By giving students choice, teachers promote a sense of independence and provide opportunities of personal challenge and creativity” (Peterson, 2011). Below is a techerentiated assignment created for my Rock History class. Students received a Menu Choice Board in which they had to choose one project in each of the different meal choices. Appetizers included pinning a landmark on a Rock and Roll Landmark Map created using Google Maps or to add a resource to an annotated Rock and Roll History Resource List compiled in Google Docs. The main course students could choose between creating a rock and roll musical tree of influence using an online mapping tool like Popplet or bubbl.us. Students would have to map out the different musical influences of a particular artist going back as far as five or six generations of influence. Or, students could choose to compile resources for a particular theme or decade in music history using Livebinders. For dessert, all students were to complete the Rock and Roll Bingo Trivia Hunt. For an A students had to complete the entire bingo board and get the entire bingo board correct. For a B students completed four rows or columns and for a C students had to complete three rows or columns. >>> Binder Control – Doug Lemov recommends in Teach Like a Champion (2010) requiring all students keep a binder for an organized system to store, organize, and recall what they’ve learned. It is not only about keeping a binder, but requiring students to number papers that go in the binder so you can send students to “number 24” when looking through old notes or have students study “items 12 to 23” to prepare for the test. The key with binders is to pass out handouts to students already 3-hole punched so that students can immediately put them into their binders. Also, keep a sample binder in the front of the classroom for a reference so that students can check and see what they are missing or if they have the papers in the right order. Occasional binder checks are a must and might motivate students keep their notebooks organized to earn a good grade. >>> Journals instead of Binders – If your class requires minimum paper, I recommend journals or composition notebooks to house all student classwork, writing, and reflection. I ask that my students write a heading on each entry of their journal so that when we go back to the notebook we can find the material we are looking for. I also have my students use post-it notes to help create tabs for different sections of their journals. For example, Do Nows have their own section, mini-lesson notes, and guest speaker responses all have their own sections in student journals labeled with tabs created with post-it notes. Every month I give students sticky notes to create (or add to) a Table of Contents in the front of his or her journal so that we know the contents that have been added to the journal. >>> Checklists – When assigning large projects, include a check list along with the rubric for students to go through to help support and scaffold the various steps of a project or writing assignment. The checklist can be as simple as a YES or NO checklist with questions such as: Essay has a clear topic sentence, Thesis is stated in the last sentence of the first paragraph, Reread the entire essay for spelling and grammatical errors. The simpler the checklist the better. >>> Calendars & Planners – Have a large calendar posted in the front of the classroom and online for students to see due dates and deadlines. Color code the calendar so that students can visually see the deadlines for daily homeworks verses projects and essays. >>> Organizational Tech Tools – Richard Byrne offers 15 different technology tools and apps to help students get organized like Remember the Milk and Deadline. Click here for the entire post. Teachers need to help students stay organized by periodically offering binder clean-outs like locker clean-outs. Remind students of due dates and model your own organizational strategies. Organization is not something that can be addressed in the beginning of the school year and then assumed that it will be maintained throughout the school year with out daily support and weekly attention.